Ferroresonance is more likely to happen with transformer banks of certain connections, particularly when the bank is energized or deenergized using single-pole switches at a location remote from the transformer, or when a conductor or fuse at a relatively distant location opens. The table below shows frequently employed three-phase transformer connections, which are prone to ferroresonance. The possibility of ferroresonance also depends on the system and transformer electrical characteristics. 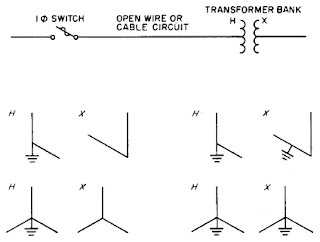 Given a particular transformer connection, the presence of phase-to-phase and/or phase-to-ground capacitance of the lateral circuit and the transformer internal capacitance are the main parameters that have the most effect on the establishment of ferroresonance during loss of phase or open-phase conditions. The phenomenon will happen only if the capacitances of the transformer and lateral circuit are within a given range. The lower and upper bounds of this capacitance range are established by the transformer size and design, as well as the primary voltage. Typically, ferroresonance is more probable with smaller transformers in higher primary voltage. Nonetheless, ferroresonance can occur even if NOT all of the above-mentioned conditions are satisfied. For example, in a 34.5 kV multigrounded neutral overhead system, ferroresonance with overvoltages as high as 4-5 per unit has been recorded when energizing, even at transformer terminals, ungrounded WYE-delta banks utilizing small single-phase transformers. On the other hand, although not likely, ferroresonance can occur for primary voltages below 12 kV when single-conductor shielded cable is used to connect the single-pole fuses to the transformer. Three-Phase Transformer Bank Connections indicated below are least susceptible to ferroresonance. This is because the line-to-ground capacitance of the lateral line and transformer is bypassed by the solid connection to ground. However, please take note of the term “least prone” – meaning they can still be subjected to ferroresonance but at a lower risk. For example, if YG–yg transformer is supplied through open-wire circuits where phase-to-phase capacitance exists, ferroresonance could occur whether or not the bank consists of three single-phase units or is a triplex three-phase unit. Fortunately, the length of line required for ferroresonance under these conditions (over three kilometers) is greater than that which normally exists between the single-pole devices and the transformers. However, there should be caution if a delta or ungrounded wye capacitor bank is installed between the single-pole devices and transformer, since such condition leads to ferroresonance. 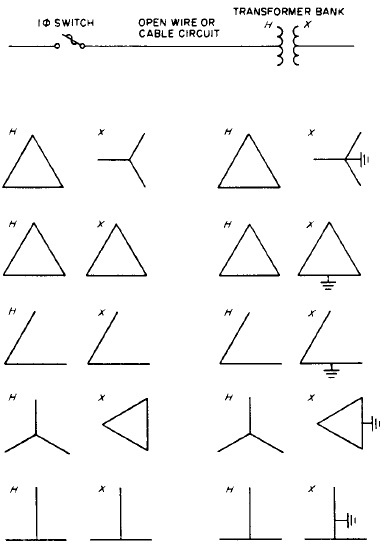 Otherwise, the transformer connection with grounded WYE or grounded OPEN WYE primary is considered free from ferroresonance. Thank you for this helpful stuff I got at your site. The stuff here is really good and keep up sharing. I will bookmark this page now and will be back soon to get more. Is ferroresonance an actual sound that can travel or resonate through electrified wiring...and then into a person's home? I have had a very high frequency noise in my home for 1-1/2 years, since installation of digital electric meters in my neighborhood. We believe the transformer on a utility pole near our home is somehow interacting with the new noise created by the digital meters, to create a resonance problem in our home. How can a person identify a service that would provide more technical information in order to identify a solution? Local tradespeople are not trained to do this. And the utility is denying that the sound emanates from outside the home (they suggest it is coming from within the house, but our investigation of our house suggest that is not true). Thank you in advance!